Dry-Packs Steel Dehumidifier Canister contains a large volume of Silica Gel (300 grams), Sturdy Construction, Portable, & Electric Free (NO CORDS). 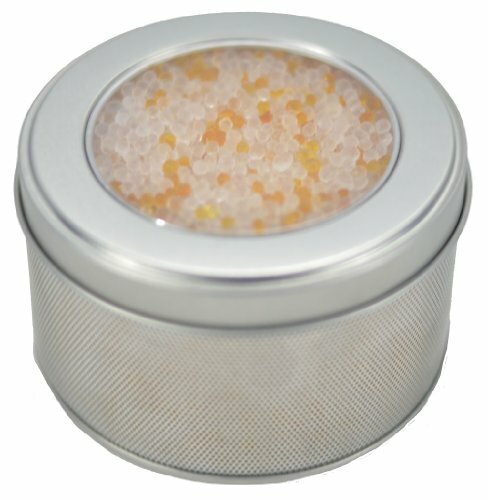 Using top grade orange indicating silica gel in a compact and portable aluminum canister makes it one of the most versatile desiccant products on the market that is easy to reactivate. Dry-Packs Dehumidifier Canister provides a lifetime of protection for your gun case, ammo storage, electronics, camera bag, shoes, tool boxes, cabinets, drawers, tackle box, backpacks, camping gear, RV's, trailers, storage bins, coin collections, craft supplies, etc. It's built-in indicator will turn from Orange to Dark Green signaling a need for reactivation. It can be reactivated in the oven and reactivation instructions are right on the unit. This item is direct from the manufacture and is in stock and ready to ship. Our Dry-Packs Indicating Silica Gel Desiccant Canisters do NOT contain Cobalt Chloride (II) (Indicating Silica Gel that is usually Blue in color which has been linked as being possibly carcinogenic to humans and been labeled as hazardous material in some countries) which is currently sold by other brands in the USA. Our Indicating Silica Gel is reformulated to remove Cobalt Chloride (II) which provides our customers with a safe Indicating Silica Gel Canisters for our customers. Our Indicating beads will turn from Orange to Dark Green when the Silica Gel is about 60% absorbed with moisture. 300 Gram Dehumidifier requires no electricity! Cobalt Chloride free indicating Silica Gel lets you know when it needs reactivating! Dry-Packs 112gm 4-Pack Silica Gel Desiccant Packet, 5 by 3.25-Inch.